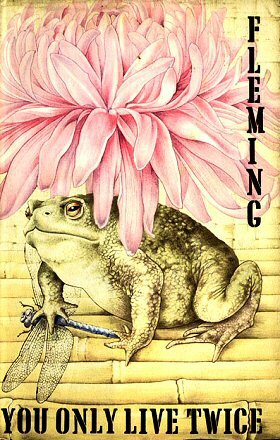 Part 1 / "It is better to travel hopefully..."
Part 2 / "...than to arrive"
Above: British Pan paperback 2nd edition (1971). Following the death of Tracy, Bond has become a liability to the secret service, and on the advice of Sir James Molony M decides there is only one possibility of turning Bond around - to send him on an impossible mission. Bond’s job is to get direct access from the Japanese to Magic 44, the project revealing all Soviet radio transmissions. In Japan, Bond is directed by Australian Dikko Henderson to Tiger Tanaka, head of Japan’s SIS. However, the Japanese already have Blue Route, a Chinese information system, which Bond hoped to exchange for Magic 44. Tanaka shows Bond an example of Magic 44's work, an instruction by the USSR trying to blackmail weaponry from England, and Bond sends this home and thus averts a major crisis. Tanaka chooses to give the access to England in returning for Bond completing a mission, on which Tanaka’s best man had already been killed. Dr Guntrun Shatterhand, a Swiss botanist, has opened a garden in a Japanese castle, but has stocked it only with deadly and poisonous birds and fishes. Every year, thousands of Japanese flock to the garden to commit suicide. Bond must kill Shatterhand to gain Magic 44. 007 now undergoes an extensive training programme, and is trained as a ninja and disguised as a Japanese. Through this wonderfully-written travelogue section, Bond slowly becomes Japanese. 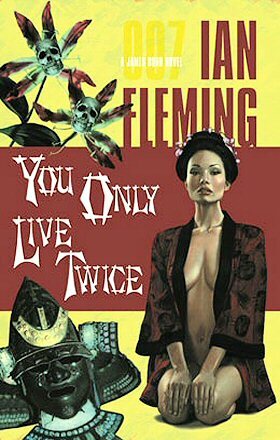 Bond chooses to climb up to the castle from the cliffs, helped by transport from Ama tribes of fishermen, and on Kuro Island he meets up with the stunningly beautiful Kissy Suzuki, who was a Hollywood star before choosing her life of poverty as a fisherwoman. Bond gets to know the tribe and goes fishing every day with the naked women. But Bond also knows one thing Tiger doesn’t. Shatterhand is Ernst Stavro Blofeld. Bond recognised him at once from a photograph. 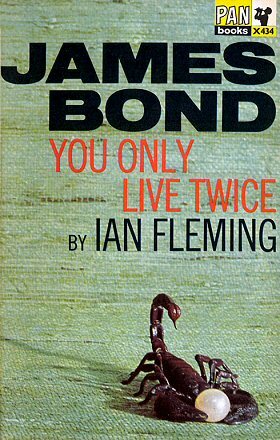 With Bunt already dead, Bond switches the geezer so that it will blow up the castle and he grabs the rope of a helium balloon to escape. But a bullet hits him, and he plunges into the sea. We read Bond’s obituary in The Times, and only afterward do we learn that Kissy picked Bond half-dead from the sea, and nursed him into health and into love with her. Bond is suffering from Amnesia, but finds a piece of paper in his pocket saying ‘Vladivostok’ and, not even knowing who he is, Bond heads for there. Tiger clapped his hands softly. He said with real delight, 'But that is excellent Bond-san. Most sincere.'" "The whole demoniac concept was on Blofeld's usual grand scale - the scale of a Caligula, of a Nero, of a Hitler, of any other great enemy of mankind." "Bond softly unzipped his container and took a bite of one of his three slabs of pemmican and a short draught from his water-bottle. God, for a cigarette!" 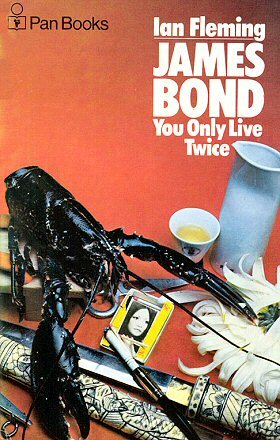 "James Bond wrestled with his chopsticks and slivers of raw octopus and a mound of rice." "Tiger Tanaka's face darkened perceptibly. 'For the time being,' he said with distaste, 'we are being subjected to what I can best describe as the "Scuola di Coca-Cola". Baseball, amusement arcades, hot dogs, hideously large bosoms, neon lighting - these are part of our payment for defeat in battle.'" "A sensational imagination, informed by style and zest"